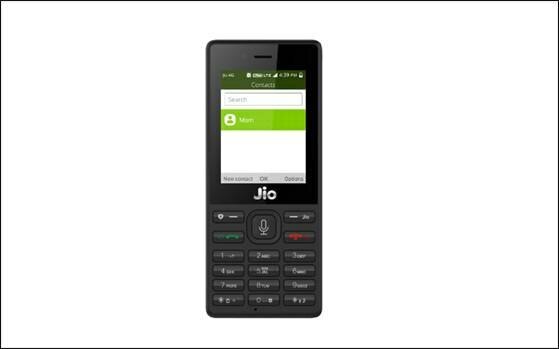 The pre-booking process of India Ka Smartphone ‘JioPhone’ has finally started. Still scratching your head where to begin from? Then, this post will help you indeed. All, who’d been awaiting the arrival of 4G VoLTE JioPhone since a long time, can now pre-book it via online or offline modes. They can reserve orders by using the official website of Jio, MyJio app, or any Reliance Jio offline retail shops. The booking started from yesterday i.e. 24 August 2017 at exactly 5pm. The main event showcasing this smartphone took place in Mumbai. The 2.4-inch JioPhone is packed with 1.2GHz dual-core processor, 512MB RAM and 4GB internal storage expandable up to 128GB via microSD card. Making it user-friendly for every Indian, the phone is available in 22 regional languages. Its 2000mAh battery, NFC to carry out electronic transactions, Wi-Fi support, and a special voice assistant would give you an elite feeling at no cost. What else? Besides famous social media applications, the phone will also support many amusing apps such as JioMusic, JioCinema, JioXpressNews and JioTV. In 2016, to woo the new iPhone users (buying iPhones from 1st Jan 2017) and keep the craze alive among the customers, Reliance Jio came up with a catchy offer where they’ll offer them data pack at negligible prices. Now, let’s see what other lucrative offers the company can offer to its smartphone buyers. Open the app on your smartphone and select the ‘Pre Book Now’ tab. Give your cell number along with the area pincode, and tap on ‘Proceed’. Voila! You’ve booked your JioPhone. Now, you’ll receive a unique booking ID via SMS and on the app. Just show it to the said retailer at the time of laying hands on your device (for verification purposes, and that’s it. If you want to book this phone for any of your friends or family members, provide their phone number (the one they use) along with the delivery code. Pay the specified amount and you’re done. For confirmation, you and your friend’s cell number will get an SMS informing about the designated retailer and booking ID. Reliance JioPhone is totally free guys! Yes, you’re not dreaming. However, you’ll be supposed to provide Rs. 1500 as a refundable security. Pay Rs. 500 at the time of placing the order, and the remaining amount of Rs. 1000 while picking the order from store. How long will it take to get the smartphone? The earlier you place the order, the earlier you get the phone. As simple as that! It was Reliance’s goal to deliver 5 million units each week. However, with this overwhelming yet unexpected response from the buyers, it seems difficult to accomplish this target. So, how many of you are just downloading the app or visiting its official website to place orders for JioPhone? This Jio Phone is on high demand in market after Jio internet success but I heard somewhere that this phone is only good for those don’t prefer to use smartphone.